Justice League International: What Happens Next? With the cancellation of Justice League International--not one of DC's lowest-selling titles and not one that was being widely discussed as "on the bubble" prior to being axed--a lot of discussion popped up in the comics press speculating that the series might be ripe for a relaunch on some level with a "season two" approach soon after it ended. That Dan DiDio and Geoff Johns are writing Justice League Annual #1, out this week as a kind of coda to the series, led some of us to believe that the JLI was likely to return in some form, written by one or both of DC's highest-ranking writers. Then, today, the publisher announced that Geoff Johns and David Finch would launch a new Justice League of America title in 2013, featuring a roster of B-list heroes with A-list potential led by Wonder Woman's longtime love interest Steve Trevor. 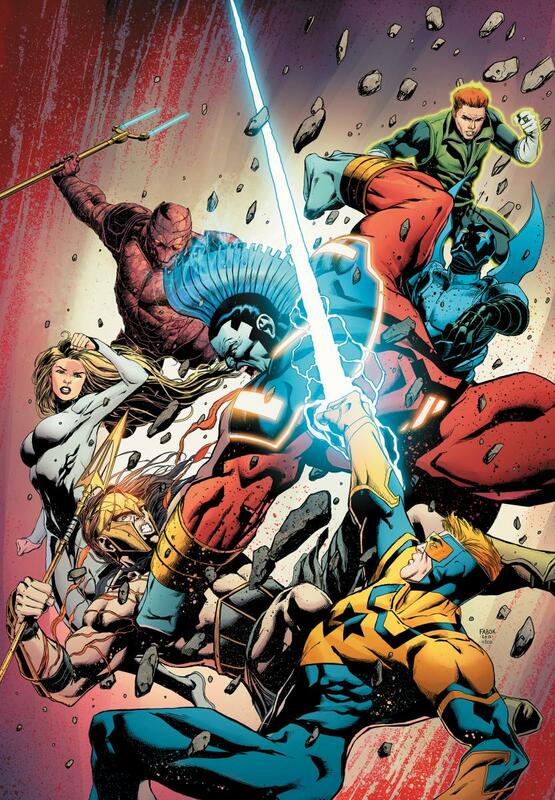 None of the members of the Justice League International appear on the solicited promotional image for the team. An incredibly fan-friendly and lucrative brand name that's got a lot of goodwill attached to it, JLU could serve two purposes. It could act very much like the animated series version of JLU, where the team could cycle members in and out willy-nilly, which is something that Justice League International did during its recent, brief run in print anyway. Secondly, that could be a bit of a code word for the League being cosmic. With the possibility that time is (already) broken in the New 52 comes the possibility of Booster Gold's son (Rip Hunter, Time Master) showing up to recruit Booster and company to help him fix it. While it never came to fruition, there was actually a teaser in Booster Gold #1 that showed the JLI, led by Booster and Batman, taking part in one of DC's big "red sky" crossovers. Much was made at the time of the fact that Firestorm appeared to be white again in the image, which is something we've seen on Dan Jurgens' post-JLI Firestorm covers, not that it means anything necessarily. What better name than "Justice League Unlimited" for a JL team that moves through time and the multiverse, helmed by one of DC's top executives so as not to run afoul of this delicate new ecosystem of continuity they've built, picking up and then discarding members depending on what world or time they find themselves in? Will it happen? Almost certainly not. But if it does, I want credit for being right. And if anything less awesome happens, now I'll be disappointed because I can't unsee this.